Legislative Update from Rep. Frank Iler – January 23, 2018 – Frank Iler for N.C. House – Brunswick County, N.C.
Last week the General Assembly almost shut down due to 6 inches of snow in Raleigh. However, I was able to bring some of it here to Brunswick County. Tuesday we had a distinguished visitor from the N.C. House education leadership, Representative Craig Horn of Union County. Rep. Horn is Chairman of the House Education K-12 Committee, which handles all education bills dealing with our elementary and secondary schools in the state. 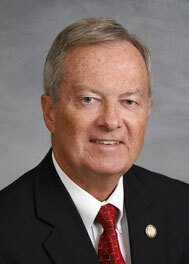 He also chairs the Appropriations Committee on Education, which does the education budget. Currently he co-chairs the Joint Legislative Task Force on Education Finance Reform, which is looking at improving school funding. Rep. Horn was in Brunswick County at my request specifically to meet with Chairman Charlie Miller and Vice Chair Catherine Cooke of the Board of Education and Chairman Frank Williams and Vice Chair Randy Thompson of the County Commissioners and explain what is going on with the class size issue. We could only legally meet with two members of each board, but other county and school staff members attended the meeting. With the confusion and misinformation surrounding the history and future of the issue, I was convinced that he could bring some clarity to it. Brunswick is one of a handful of counties Craig chose to visit. I appreciate our relationship, as I am a member of his Education Committee and his seatmate, sharing a desk on the floor of the House. Craig explained the long history, including the three years notice that local school districts have had to plan for it, and has not been rushed, as some district boards have said. He also explained how funds have been allocated that could be used for this purpose, and how some districts have used them for other purposes. Then he volunteered what possible steps may be taken to resolve the remaining issues on class size, including additional funding. He emphasized the urgency that something should be done in the coming month or two. The leaders of the two boards expressed their appreciation for Rep. Horn driving the seven hour round trip to meet with us, and seemed to gain a better understanding of the steps we have taken and will take to ease the burden on local leaders and teachers. They were pleased with Rep. Horn’s commitment to listening to local leaders and his desire to work out a solution that will reduce class size without putting an undue burden on local schools. I, for one, remember when I first went to Raleigh the education establishment was asking for smaller classes in grades K through 3. Now it seems to be the opposite. Our goal is to do what is in the best interest of the individual student so that they have the best chance to read at grade level by 3rd grade. Since my two committees scheduled for Wednesday and Thursday were cancelled due to the snow, I was able to attend meetings here in the district that I would have missed. The Brunswick Shoreline Protection Consortium met at 10:00 on Wednesday and got updates from the Corps of Engineers, the Director of NC Beach, Inlet, and Waterway Association, and me on what is taking place to improve our beaches and inlets. Thursday the Southwest Brunswick mayors met in Shallotte, where they communicated and shared ideas among themselves. It is always good to hear directly from these leaders. I was also able to spend more time in the new district office in Shallotte on Thursday. This week we have been called back into session on Tuesday, Wednesday, and Thursday. I hope to see some action on our House Bill 189 on water quality by the Senate and movement by both chambers on class size. I am sure redistricting will also be a topic. As they say, “Stay tuned”.